J'ai besoin d'aide...je ne trouve nulle part la composition précise de la Division légère mécanique qui a combattu durant la campagne de Tunise, rattachée au XIXème corps, ni la composition de ses équipements. Quid des autres engins blindés? R35? D1? H35? H39? Automitrailleuses? Les FT servaient de défense statiques sur points d'appuis et aérodromes. Ce n'est pas de 12ème RCA qui a ensuite été intégré à la 2ème DB ? Surnommé parait-il le "12ème Nazi" en raison de ces origines "vichyssoises"
Mais ce n'était pas très gentil car ils ont quand même attaqué des Tigre avec...des Somua, et n'ont pas combattu contre les alliés! L'Afrique du Nord dans la guerre: 1939-1945, Christine Levisse-Touzé. La France dans la guerre de 39-45, Pierre Montagnon. Apparemment, ce recueil de témoignages traite largement de la B.L.M. - Batterie anti-chars et quelques 25mm anti-aériens. In Tunisia, the ex-Vichy tanks fought quickly against the Axis forces, for example the old Renault D1 tanks. After the Armistice 107 Renault D1 remain in North Africa. The battalions are disbanded and part of the tanks (20) is hidden to the Axis while part (87) is stored and under control of the Italians. After negotiations in 1941, 62 of these tanks are at first given back to the Vichy, officially for the defense against the allied attacks. A few months later the creation of the tank squadrons is authorized by the Italians, officially only 2 squadrons in the 2e RCA but additional squadrons are formed secretly. * formed on 1 July 1941 with the 3rd groups (2 motorized infantry squadrons) from 3e RCA and 5e RCA. Between November 8-10, 1942, the regiment fought against US troops landing near Oran. Only a reduced squadron of the 2e RCA (6th squadron with 10 D1 tanks) took part to the combats against the Axis forces in Tunisia. The tank component of the BLM is therefore rather weak but on November 14, 1942 the BLM is reinforced by the D1 squadrons from 5e RCA. These Renault D1 tanks will operate on the frontline from December 1942 to February 1943. The BLM was e.g. engaged in the battle of Thala on February 23, 1943. The first actions of Renault D1 tanks are nonetheless to be credited to the 15 tanks of the 7th squadron of the 4e RCA in mid-November 1942. The BLM is assigned to the reserve of the French Army Corps in March 1943 for instruction/training on Valentine tanks. After the Tunisian campaign, 10 Renault D1 tanks remain in the 1st squadron of the 8e Groupe de la Garde in Tunis. This will be their last assignment. Finally, the 2e RCA becomes part of the 1st French Armored Division (1e DB) with US tanks (1 light tank squadron and 3 medium tank squadrons). The 1e DB will land in southern France and takes part to the battles in France, Germany and Austria in 1944-1945. Tanks from the 2e RCA (detachment of Lieutenant de Loisy) are the first allied ground troops reaching the Rhine on November 19, 1944 (at Rosenau, north of Huningue, next to Mulhouse). - 7th tank squadron (15 Renault D1 tanks) and 21st motorcycle squadron. A 4th squadrons group is formed in March 1943 with the 7th tank squadron alongside 21st motorcycle squadron. The 4e RCA is the only regiment that still contained elements of horse mounted cavalry. As said before, the 4e RCA is also the first former Vichy Army in North Africa armored unit to fight the Germans during the battle of Medjez-El-Bab on November 19-20, 1942. The regiment also took part to other battles: Djebel Mansour, El Aroussa (December 18, 1942), Siliana (January 20, 1943), Ouenza (February 25, 1943) and Gambetta (April 17, 1943). The regiment leaves his horses in March 1943. In late 1943 the regiment is used to recover enemy equipments in the Cap Bon and is later reorganized in a tank regiment with 1 light and 3 medium tank squadrons with US equipment. The regiment is assigned to 3rd French Armored Division (3e DB). The incomplete 3e DB is disbanded on September 1, 1944, with elements dispatched to France shortly afterwards as reinforcements and replacements for the 1e DB. The 4e RCA becomes in September 1944 the tank training centre for the French 1st Army (Centre d'Instruction de l'Arme Blindée de l'Armée B). In November this CIAB/1st Army is transferred to France. The 3e DB will be formed again in May 1945. - 3rd tank squadrons group (Chef d'escadrons Grosjean): 5th and 6th tank squadrons with initially only 20 Renault D1 tanks apparently and crews from the ex-61e BCC. Apparently the strength might have increased to 35-40 tanks. 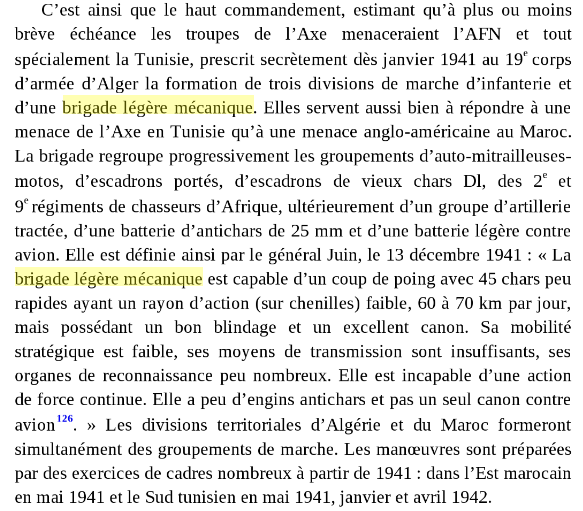 The 5e RCA is garrisoned in Algeria. A "détachement de marche" was formed with the 1st and 3rd groups under command of Chef d'escadrons J. Rouvillois and moved to Tunisia with the BLM end November 1942 This detachment fought at djebel Zaghouan in April-May 1943 before returning to Algeria. In March 1943, the tank group receives Valentine tanks. Reorganized in June 1943, the regiment is equipped in October 1943 with US tanks and has 4 squadrons (1 light and 3 medium). It is part of the 5th French Armored Division (5e DB). The regiment lands in southern France in August 1944 and takes part to the liberation of France and the combats in Germany. * 2e RCA: chars D1, AM Laffly 50AM. * 4e RCA: chars D1, AM Laffly 50AM & Laffly 80AM. * 5e RCA: chars D1 et (peut-être) AMR-33, AM Laffly 50AM & Schneider P16.